Preheat oven to 460° F.
Place cauliflower florets in single layer on one or two cookie sheets. Drizzle with olive oil and season with salt and pepper. Bake cauliflower for 20-25 min or until it tender and brown in spots, turning cauliflower once or twice. While cauliflower is roasting, make the tehina dressing. In a small bowl combine tehina, water, lemon juice and garlic. Season with 1/2 tsp sea salt and 1/2 tsp cracked black pepper. 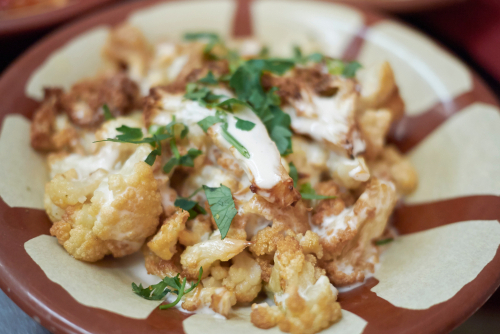 Remove cauliflower from oven, drizzle with tehina dressing, and garnish with chopped herbs to serve.